Never before in the history of Sierra Leone, has the tearing up of the country’s constitution by a sitting president, brought so much chaos and outrage. 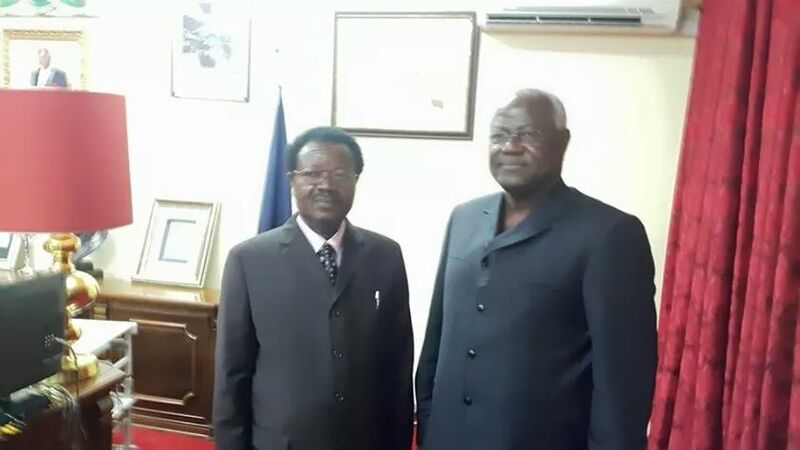 (Photo: Koroma – right and the new VP – left). President Koroma’s decision to summarily sack the country’s elected vice president and to then oversee the coronation of his handpicked replacement, is far worse a constitutional violation than any of the misdemeanours committed by his demagogue and former dictator – Siaka Stevens, in the 1970s and 1980s. But there is a marked difference this time, accentuated by a strong condemnation of Koroma’s leadership, by no less a person than the son of former president Stevens himself – Dr. Jengo Stevens. On Wednesday, former minister and Attorney General in the Stevens APC regime, who is also regarded as one of the architects of the country’s constitution – internationally acclaimed constitutional lawyer – Dr. Abdulai Conteh, strongly criticised Koroma’s dictatorial decision. Dr. Conteh described president Koroma’s unilateral decision to set aside the provisions contained in the country’s constitution – only to dismiss the vice president by the wave of a hand, as unconstitutional and unlawful. Yet, despite massive criticisms at home and abroad, president Koroma has shown what happens, when a despotic ruler arrogates absolute power to himself, in the self-belief that his supreme leadership and authority are above the constitution. President Koroma has become a danger to his own people that elected him to the office, whose sacred authority he is now disrespecting and abusing. By his side, ready and waiting for the president’s call from State House to brutally crush any peaceful demonstration is his newly formed and highly paid personal armed militia – most of whom are from neighbouring Guinea, courtesy of his close friend – Guinean president Alpha Conde. The country’s main opposition SLPP, whose rather muffled voice in the face of the barrage of criticisms of the president’s bad behaviour, has also published a public statement, condemning the president’s actions. Members of parliament representing the SLPP, said yesterday, in a statement titled ‘misuse of executive authority’, that they “…are appalled by the purported removal from office of the elected vice president Alhaji Samuel Sam Sumana, in contravention of the constitution of Sierra LEONE, Act No.6 of 1991, which action is further compounded by the untenable replacement with ambassador Victor Bockarie Foh. “As indicated by the Sierra Leone People’s Party in a press release dated 18th March 2015, this is in blatant violation of the provisions in sections 51, 54(8) and 55C of the 1991 constitution which stipulates the circumstances and the process whereby a vice president may be removed from office. “In this regard, the sacrosanct authoirt of parliament as stipulated in section 51 has been ignored and undermined. “We the SLPP members of parliament do hereby remind his Excellency the president of the oath he swore that he ‘will preserve, support, uphold, maintain and defend the constitution……and do right to all manner of people according to law’. 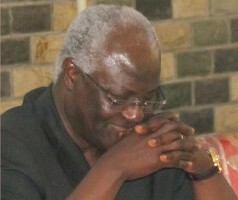 (Photo: President Koroma. When absolute power corrupts ABSOLUTELY). 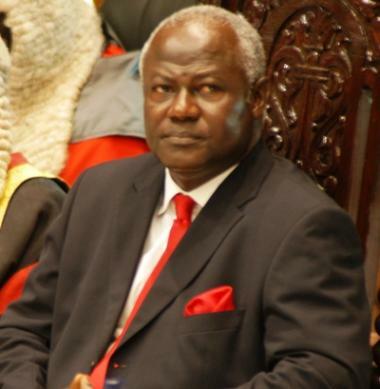 Political analysts in the country say that it is unlikely that president Koroma will dig himself out of the hole he has found himself, and that he and his legal team – led by the incompetent Attorney General, are preparing and bracing themselves for a long and deliberately drawn-out adjudication by a Supreme Court under his control. 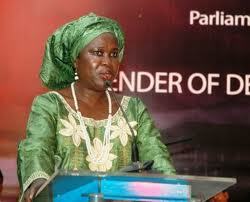 Will the opposition SLPP parliamentarians walk out of parliament in protest? 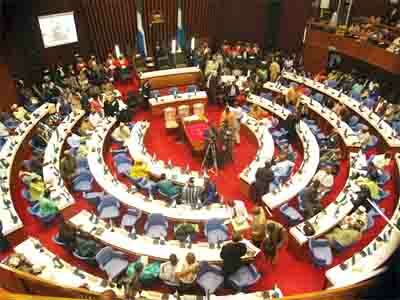 And will they bring forward a motion to impeach the president himself, in order to save Sierra Leone from dictatorship? Yesterday, Friday 20th March, 2015, the country’s umbrella trades union body – the Labour Congress, also criticised president Koroma’s actions, which they referred to as unconstitutional and unlawful. This is what the Labour Congress said: “The Sierra Leone Labour Congress (SLLC) has observed with grave concern, the ongoing political saga involving the removal from office of Alhaji Samuel Sam Sumana – vice president of the Republic of Sierra Leone, by his excellency – the president of the republic of Sierra Leone, Dr Ernest Bai Koroma, as issued in a press release from the office of the president dated 17th March, 2015. “As a national institution representing workers in this country and an advocate for the promotion of good governance, democracy and the rule of law, we have carefully gone through the provisions in the 1991 Constitution Act No 6 of the republic of Sierra Leone in respect to the election and removal from offices of the president and vice president. “1. That Sections 41 and 42 of the Constitution Act No 6 of 1991 make provisions for the qualification and election into office of the president, while Section 54 (1), (2) and (3) of the 1991 Constitution make provisions for the coming into office of the vice president. These positions are conjointly elected. “2. That Section 49 makes provision for the vacancy of the office of the president and Section 55 makes provision for the vacancy of the office of the vice president. “4. That membership to a political party for a candidate for the presidency and vice presidency as prescribed in section 41 (b) in our view is only an entrance requirement and qualification for persons seeking to be elected as president and vice president. “5. That the removal of a vice president should be in accordance with Sections 50 and 51 as prescribed in Section 54 (8) of the 1991 Constitution. “The Sierra Leone Labour Congress’ view is that the reasons advanced for the removal of the vice president, do not conform to the provisions stipulated in the said Constitution which is the Supreme Law of our Land. “In conclusion, The Sierra Leone Labour Congress wishes to remind all, of the role and sacrifice of workers in this country in bringing, nurturing and maintaining democracy in the country. “The Sierra Leone Labour Congress is strongly of the view that the current political developments have the potential to derail and undermine the peace, democracy and stability of the country. Sources close to the executives of the Labour Congress told the Sierra Leone Telegraph that they are discussing options for some kind of industrial action, including and not limited to an all-out strike, should the current political impasse and instability continues. It remains to be seen whether president Koroma will withdraw his press statement announcing the sacking of the vice president, as well as rescind the coronation of his newly handpicked vice president Victor Foh. And the question lingering in the minds of most Sierra Leoneans is whether the opposition SLPP will table a motion in parliament for the impeachment of president Koroma, for gross misconduct, and in accordance with the very provisions outlined in Section 51 of the Constitution, which the president has disrespected. As we go to press, president Koroma is making a public address on national radio. Is he announcing his own resignation? Or is he defiantly and bullishly intimidating the people of Sierra Leone for daring to speak out and challenge his authority? The Sierra Leone Telegraph will bring you details later. Sierra Leone will never change as long as these nation-wreckers are in power. The new VP has no interest in serving the nation. His acceptance speech was sorely about himself and his party. There was no mention of how he would eradicate poverty and Ebola, provide light and water for the people. His only interests are his southerners, his party and serving the Chinese people. As for the EBK himself……he made a speech last night announcing a three day lockdown from 27th to 29th March, but no mention of what is hurting the people i.e. his blatant disregard for our constitution. He shows a total disregard for the torment of the people. How can someone be so heartless? What a poor leader. But if he cannot lead him own home when do we expect. He thinks he owns the country because he is president. Shame on those who voted him and that thieving corrupt party into power. When Solomon Berewa was giving out T shirts, money and food so that he would win votes in 2007, these voters took all he was offering , but voted instead for APC in the voting booth. Today however, APC had to turn to Mr Berewa to assist them in their silly little shinanigans with Sam Sumana. I hope those who voted for APC are suffering for that fateful decision that they made in 2007 and 2012. A party that is full of gangsters and crooks. I hope voters think carefully and use common sense when voting next time. EBK has now brought in this VP to nominate his own choice of successor….just as S.I.Koroma nominated Momoh Big wase for Shaki big nos in the 1980s. EBK, remember…..after Gbagbo nar you.